I cannot believe a year ago we found out about Eli’s impending arrival and now he’s here and almost three months old. Time goes by 900x faster when you have children. I hate it. Budget: Prior to Eli we had a really great cash only spending that seriously saved us a TON. We sort of fell of the wagon after his arrival while we adapted (aka: tried to survive) to our new life and less sleep. Now that we have a good routine I’d love to plan our meals better and prepare better for those random expenses that come up. Also, since I know how much money it costs to have two kids, some things need to change… haha! Workout Routine: We have plans to set up a home gym after the new year but I seriously need to figure out where I can squeeze in a quick run or a good 30 minute workout. The day gets away from me but I know I have the time somewhere. Blog Schedule: I absolutely love writing and it’s very therapeutic for me so I definitely need to sit down and write out a schedule that works for me. Home Projects: We will have lived in this house for 1 year in January. It’s literally perfect but we do have a few big-ish projects we want to complete! I want to plan these out and budget for them. Yes, a pool would be great but I don’t foresee that happening in 2018. *cries* haha. De-Clutter Before The New Year: I will probably wait to do this after Christmas while we clean out toys and things like that. If we haven’t touched it since we have lived here it’s probably safe to get rid of it, riiiight???? 2017 was a year for the books. I’ll do a post dedicated to this wonderful year closer to the end but just know, it’ll be written with lots of tears! What are your goals for the end of the year? Any tips to help me with mine?! I have two tips when it comes to baby gear. Buy used, and you do not need to buy everything you read about. Haha! Here is my list of some serious must haves when you have double the fun running around your house. – Bouncer : sometimes you need to put baby down in a safe place. Also, make sure it’s nothing gigantic so it’ll be portable! – Wrap: I use this the most if we don’t want to take the stroller in (grocery store, church, etc). – Wubbanubs: because #1 will probably run off with pacifiers, these are easier to find! If you are trying to put together a registry, these are your basics!. For the “gear”/big stuff … BUY USED! They grow out of it soooo quickly it’s hardly worth buying something brand new. Trust me, I dumped cash on brand new everything for Cameron and half the time I didn’t make even half of the money back. Also, neutral! I am kicking myself for buying her all pink everything. I know Eli doesn’t care, but I do. Haha. First world problems. If you are on your way to two under two, congrats!!! It’s literally the best. This is our second year to frequent this specific pumpkin patch in our area. Last year was Cameron’s first experience and it was so cute and… easy. I love these sweet people, can’t wait to go back next week with Tyler and get some shots with him. He was sad he missed it! 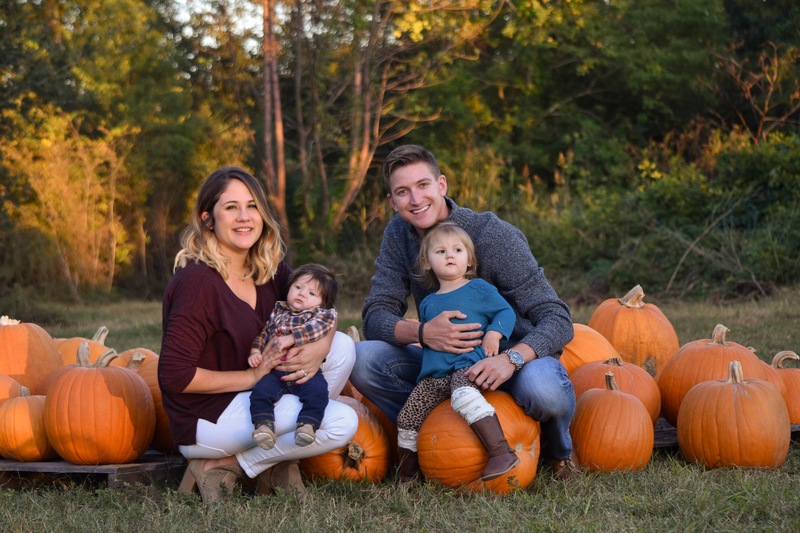 I’d love to see your pumpkin patch pictures so be sure to tag me or send them my way! This past weekend was the official launch of Grace + Ford. I launched the blog a few months ago but I am going to refer to it formally as Grace + Ford: A Lifestyle Blog or just “the blog”. Grace + Ford is where you can S H O P til you D R O P! I am totally in awe of everyone’s support and encouragement. I literally have designed…. 10+ shirts and these were the top three that I thought would really start us off strong and convey my message clearly. Grace + Ford will be full of fun, inspirational truths that will fit into anyones style of choice. Possibly some other fun things, so stay tuned. My vision for this brand is to empower you. To remind you that you can do anything you want no matter what. And to spread the love and light in a world that needs it more than ever. We can do that together. Here are some sweet shots that capture the fall launch collection. If you order a shirt, be sure to use the hashtag #shopgraceandford so I can see how you styled yours and for a chance to be featured on our social media platforms! What Is Grace + Ford? A few months ago, before Eli was born, I was feeling kind of “meh”. I have tossed this idea around for YEARS but always afraid of sharing my thoughts and what people would think. “What will people think?” is a dream killer. It held me back for YEARS and I don’t have many behind me! I am telling you now that having kids will drastically change what you care about and how you feel about what others think. Thankful for that. I love writing, I love being creative, I love learning and blogging has fulfilled all of those things! So, being in this new position, I decided to go for it. It came with A LOT of research and reading before I started. I wanted to do it correctly and most of all I wanted to learn how I could reach and become a positive influence to just one person. That was and is my goal everyday. I just want to reach one person. With the blog, I have “met” (ya know, my internet friends) so many awesome moms/bloggers/mombloggers that I am so thankful for. Complete strangers, cheering me on and letting me know that I spoke to them through one of my posts. That is what it is all about for me. Not the money (some bloggers can pay their mortgage and then some) not the free stuff, not the followers. That stuff is just that… STUFF. So after the blog took off, my backseat dream (the one you don’t really ever pursue for whatever reason) started creeping back up. I just really want a storefront boutique, one that is small, full of beautiful things and doesn’t cost you an arm and a leg, which is hard to come by. I do not have the time or resources (read: money / two kids under two) to start something like that so we (Tyler and I) started the smallest way possible. I set up an online store, reached out to his t-shirt contacts and started on some designs. I am saving every penny for “the store”. I don’t know when it’ll happen. Maybe 5 years or 10. I have no idea, but when I pray the “Is that what’s next?” prayer I will feel the peace that I don’t have about it right now. BUT I can tell you, I have had so much peace about starting small and building a community around Grace + Ford that want to help me succeed and spread our message. Here we are, building the Grace + Ford brand. If you read my posts and never like or comment, you are building my brand. If you go to my website, window shop and never buy anything, you are building my brand. Just having that 1% interest in Grace + Ford, builds my brand and I AM SO THANKFUL FOR THAT 1%. *Also, if you think I can’t/won’t do it, you are also building my brand, haha! These designs are straight from my fingertips. I send them to a graphic artist and she can put them directly on the shirt without changing them. Seeing what I spend hours on the computer (usually during nap time or midnight) trying to perfect being worn around town is extremely rewarding. If you shop with me, you are literally apart of someone’s wildest dreams coming true. How cool is that? Other than striving to be a source of inspiration, my other main goal is keeping my prices low. I have seen stores where you can buy similar things for almost twice my prices. I don’t know about you but I like getting more bang for my buck. I want everyone to be able to shop and I want everyone to be apart of this. If you want to visit, there is a tab at the top of the page that says “shopgraceandford” that will take you straight to the website. I’ll probably be saying this everyday for the rest of my life but THANK YOU. Thank you for your support, encouragement, words of wisdom, compliments, and for being apart of this with me. It means the absolute world to me and I want to make sure you don’t forget it! From baby gear to your mental state, there will be lots of new changes and an extra bum to clean with two under two. 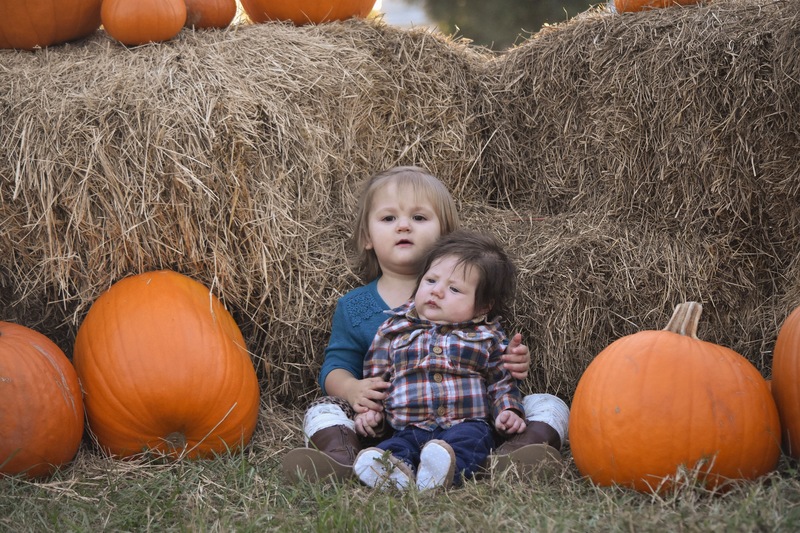 This is my round up of survival and staying sane with two under two. Volume 1 of this series is going to cover the least talked about topic when it comes to motherhood… your mental state. If you are pregnant, come back and read this once baby is here. When I read these articles during my second pregnancy I skipped over a lot that I didn’t think applied to me. It did. It does. It’s an adjustment, completely different one than with baby number one. Patience: Practice this now. Newborns are easy, at least in comparison to any child over the age of 12 months. Specifically, mine are 18 months apart and wheewww! Toddlers are in a league of their own. Practice keeping your emotions in check, it will really come in handy while all of those postpartum hormones are going crazy. Grace: You cannot do it all, perfectly, all of the time. Give yourself grace, daily! Some days I’m lucky if I’ve eaten more than a protein bar while worrying about my weight, and if Eli is getting enough to eat. At the same time, Cameron has had a popsicle for breakfast because she woke up on the wrong side of the bed. G R A C E. I am not perfect but my kids are SO loved and taken care of. I am SO loved and taken care of. It gets better…SO MUCH BETTER. Take Care Of Your Body: On nights when I wanted to crawl in bed and cry, I would take a long hot shower. Take care of yourself. Wash your hair even if you can barely move your arms. Shave your legs even if it’s the middle of winter. Wash your face, brush your teeth, get a mani/pedi, whatever “self care” means to you, DO IT even if you are tired. It will make a difference. Eat healthy, but if you want some queso, by all means dive in. Extra caramel on your frappe? Whatever floats your boat, you deserve it! Drink water (after your coffee) and REST! The dishes can sit there another day. Let Go Of Guilt: This is touchy. Nobody talks about it, which is annoying. The few times I did see someone open up, I thought it wouldn’t apply to me. But it does. Do not hold onto guilt. It will eat you up. Guilt about taking #1’s attention/childhood/ whatever away. Guilt about playing a second movie so you can feed the baby. Guilt about putting the toddler to bed 30 minutes early. Guilt about not getting the toddler out of bed when they first wake up. Guilt about letting your newborn fuss while you change your toddlers diaper. SO MUCH GUILT. But guess what, it’s not real. Read point number two again. 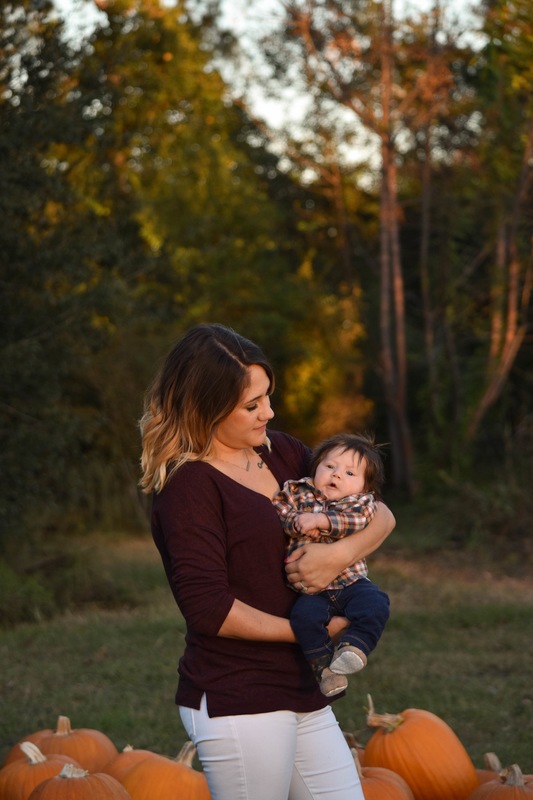 Embrace the change: It’s less about adjusting to a newborn and more about adjusting with your toddler. Learning how to pack a diaper bag with enough to take care of two. Learning how to judge who needs you the most when they both cry. Learning about the constants. Constant diapers, mouths to feed, entertaining, rocking, holding, kissing, loving… it is constant. Your heart just might explode! Lastly, grieve: This may sound morbid, but the second your baby was born a season of life passed away. You are now onto a season with two kids. You may think (I did) that we will never be able to go out to eat again or to the grocery store as a family. BUT WE DO! It seems like such a culture shock at first. Like, how on earth will I ever manage? But you do, and you can and you will. The first weeks after baby number two are an adjustment. If I can do it, anyone can. I am the worst with big changes, I absolutely love my routines! But guess what, two months later and I cannot imagine our life without baby Eli. We kept everything the same and he just melted right into our life. Sometimes, it feels as though motherhood has stolen my sense of fashion. I am determined for that NOT to be the case. Focusing on the small details and keeping my clothing simple has seriously kept me in the game. One of those small details is in the “arm party”. 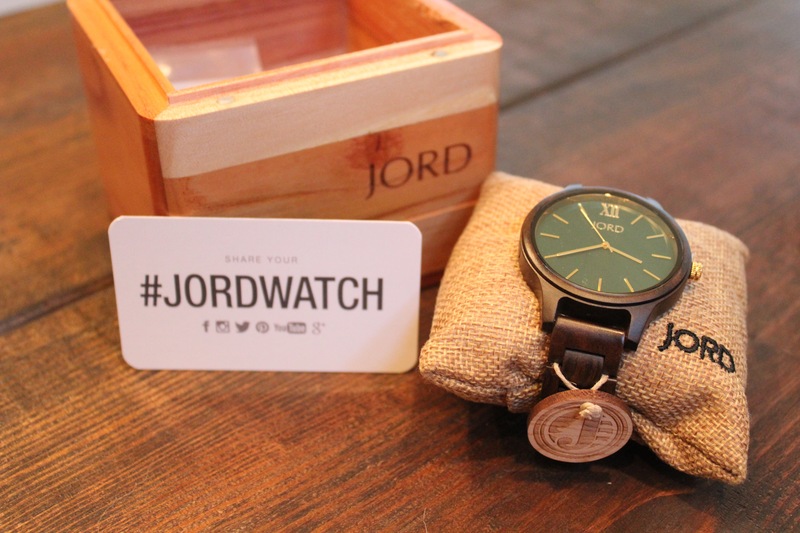 If you haven’t bumped into JORD Watches on Instagram, I highly recommend you check them out ASAP! They are stunning and make a statement with no effort. Check out the end of this post to enter the giveaway! First, let me start off with their packaging. There is sooo much attention to detail when you receive your watch. It makes a statement, too! Can you imagine someone opening this as a birthday gift or Christmas present? It has the wow factor. 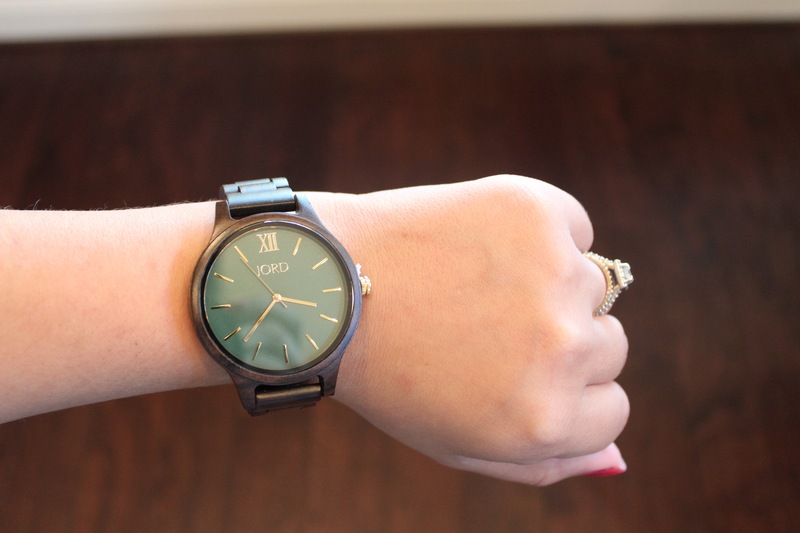 The wooden box your watch comes in is heavy and gorgeous. They really outdid themselves when choosing their packaging. 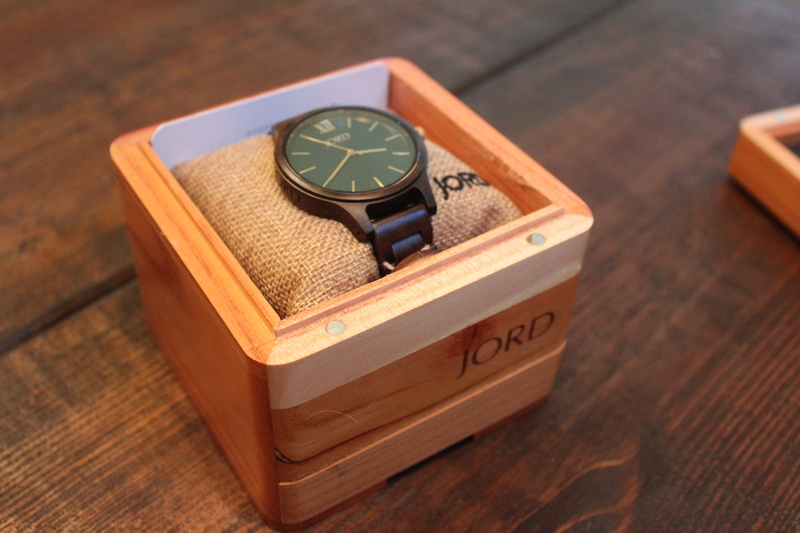 It comes with wood cleaner and a small drawer at the bottom to control the humidity while you store your watch. Attention to detail. Now, onto the watch itself. It is gorgeous! I am loving this emerald color especially during fall right now. It is a dark neutral watch with a stunning statement face. The wood in these watches is so unique which also adds a little something. Styling these is no problem. Wood goes with EVERYTHING. I have some saved for Christmas shopping, too! 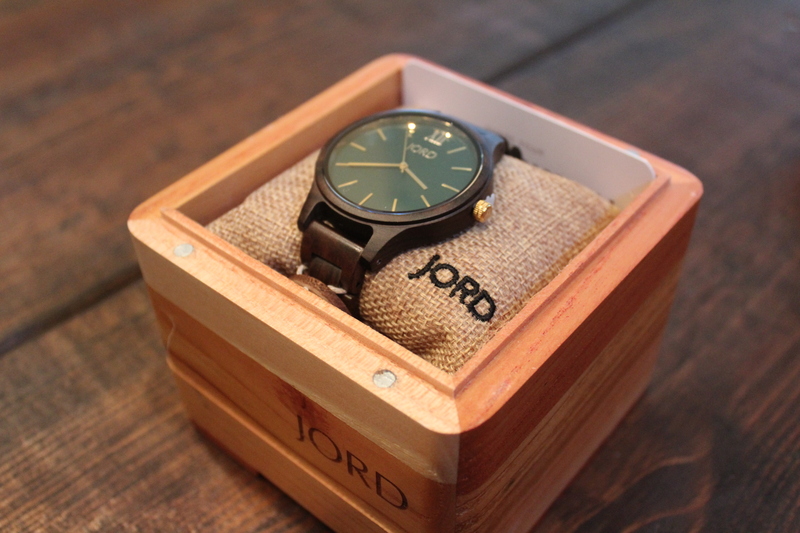 I know quite a few people that would love the “nobody else has this” factor Jord Watches has. If you want to check out the women’s shop or men’s shop on Jord’s website, I guarantee you will find something for everyone on your list. EVEN YOURSELF. Love them? Click the link below to enter to win! All entries will receive a $25 gift code and one lucky winner will receive a $100 gift code to snag a watch! Giveaway closes 11/5/2017.